Late in the night, after preparations have been made—hammocks have been strung, the participants have purged and fasted, and the brew has been sung over—the yagé (ayahuasca) ceremony begins. Sounds of the rainforest merge into a vortex of consciousness where the visible world goes black before the inner visions begin. The therapeutic practice of yagé consumption is prevalent throughout the region but is particularly well-developed among the Tukano speaking people of the Upper Amazon. Once a more populous region, many of these clans disappeared over the turn of last century as a result of exposure to illnesses for which they had no immunity. Today, the family clans of this language group, living between Perú, Colombia, and the Ecuadorian Amazon, are ethnic minorities. Among these, the Secoya (Siekopai) community, numbering approximately one thousand individuals living between Ecuador and Perú, are heirs to an ancient spiritual tradition that uses song and sound to heal. Siekopai traditional elders embody a profound ancient lineage; they are skilled administrators of the ceremony of yagé, where song and sound are used as catalysts for transformation. Jonathon Miller Weisberger spent much of 1995-2000 living in concert with certain families of the Siekopai people, in particular with the traditional maestro, Cesareo Piaguaje in the village of Sewaya Remolino, and has made periodic visits back ever since. He has served as a bridge person and cultural intermediary, with one foot planted firmly in the traditional world of the Amazonian healers, and the other navigating the paradox of Western ways. His devotion is to transmogrify the ancient wisdom amassed by generations of deep-forest dwellers into actionable knowledge and a practical skillset. Being a moxy ethnobotanist and whole-hearted student of the traditions of Tao, Jonathon works to facilitate wellness. Among his missions is to find the modern interpretation of the ancient truths, in ways that do not dilute their essence, as well as to find cross-cultural similarities among world heritage healing arts. His goal is to make them understandable and approachable to people living in the modern current of today’s world. Yagé drinking is an indigenous science, in which medicinal plants endemic to the Amazonian rainforest provide the key to unseen celestial realms. These realms emerge in the pinta, the designs or yagé toyá, where intricate celestial textures are made visible to the dedicated yagé drinker. The practice of yagé drinking is central to the Secoya worldview, which rests on a rich cosmology based on experiential knowledge imparted through the generations. The Secoya have a particularly keen insight into the spiritual-energetic dimensions of human experience in the world. While intimately connected to their natural environment, the ceremonial imbibing of yagé is a means of accessing the realms of the divine immortals, among whom the Jujupai, or doctor people, reside. These beings come to the aid of the yagé drinker in the course of ceremony, dispensing their toyá into the bodies of patients to facilitate the healing process. The tradition when followed to a T is a failsafe method for healing, spiritual awakening, energetic alignment, self-discovery, and growth. The ceremony of yagé is characterized by chanting, and the vocalizations of the ‘master of the ceremony,’ as well the call and response among participants, play a key role. Whereas in many traditions, there is an identifiable body of songs used during healing ceremonies that are fixed and repeatable, among the Secoya, vocalizations are noticeably more stream-of-consciousness. These songs, called heheñé, are quintessentially emergent, and perpetually new. The range of sounds and vocalizations incorporated into heheñé is vast, reflecting the omnipresence of spiritual helpers in every moment, infused into the very fabric of this world! Jonathon has noted that the process by which these songs emerge can be seen somewhat as “algorithmic.” This being where a set of “procedures” are applied to the infinite database of sonic possibilities, including the speech of the immortals and sounds of the forest; the celestial children’s language, onomatopoetic intonations and glossolalia emerge like a certain unplanned, dynamic computation that most suddenly allows the song to act as a medium through which the spirits can make their phenomenal existence known—sometimes in ways familiar and recognizable, and other times strangely complex and mind-bendingly, astonishingly, yet always new. Somewhat like the movement of a bird’s wing and feathers when flying through a wind. The spirit is made known not by the wind nor by the bird, but rather by how the two interact. Across the globe, song is ubiquitous as a medium for the transmission of healing forces. Shamanic practices are suffused by vocal sound production, and often they are accompanied by rhythmic/white noise elements provided by rattles, or bundles of leaves in the case of the Amazonian people. The songs can be regarded as profound sonic intonations through which the reality of the spirits, and their multidimensional abodes, can appear in plain and absolute view before the drinker’s spiritual eyes. When we begin to ask questions about the practical side of this phenomena—how vibrations, sounds, and music aid in healing practice—we are confronted with a number of challenges, foremost among them being the attempt to verbalize the effects of the unseen on the inner workings of the body. While the attuned body can sense resonance and vibration, explanations for how these forces work together on the material body are as yet unscientific. Since scientific inquiry relies so heavily on the value of observation, and thus the visual capacity of human perception, we run into problems with this assessment. 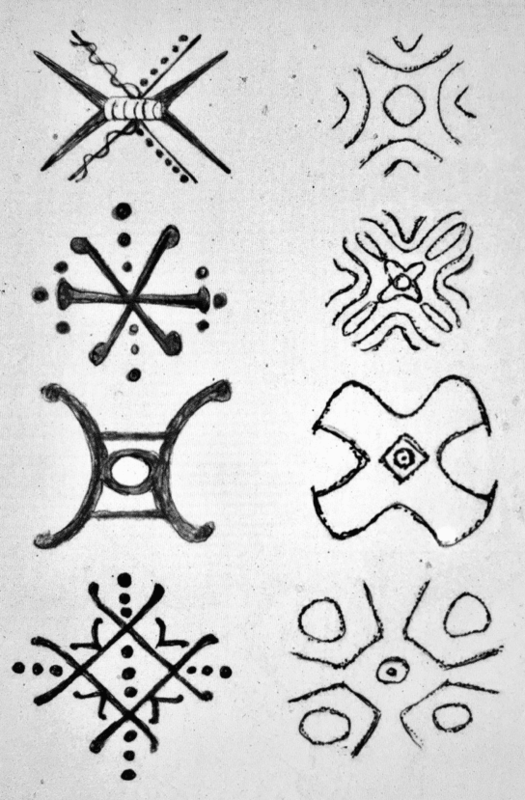 One field that provides some insight into this question is the study of Cymatics, a term coined by anthroposophist Hans Jenny who ran experiments using media, including sand on solid surfaces and still water, in order to provide visual evidence of the profound order that results from application of certain vibrational frequencies. The perfection in the symmetry resulting from experimentation with Cymatics is the stuff of wonder and awe. Jonathon has conducted a comparison of traditional Secoya designs that stem from their ceremonial healing practices to patterns that have emerged in Cymatic experiments. He has drafted the following illustration to show traditional Secoya patterns, left, in comparison with remarkably similar Cymatic patterns, on right. While there is work remaining to provide concrete “proof” of the way these processes work, the implication for fields that bring together sound and healing are profound, indeed. Undeniably, as more and more investigations are carried out that demonstrate the almost miraculous ability of song and sound to trigger healing processes, we will find new cures for pain management, for healing depression and anxiety, for spiritual education and self-discovery, and for helping people find their true life calling. Co-written by Sonia Gaind-Krishnan, ethnomusicologist, and Jonathon “Sparrow” Miller-Weisberger, ethnobotanist, informant/interviewee and author of Rainforest Medicine: Preserving Indigenous Science and Biodiversity in the Upper Amazon from North Atlantic Books. Jonathon is steward of Ocean Forest Ecolodge Retreat (formerly known as Guaria de Osa Ecolodge) on the Osa Peninsula of Costa Rica (www.oceanforestecolodge.com). The center is a spectacular space for hosting retreats amidst nature’s majesty, where the rainforest meets the ocean. 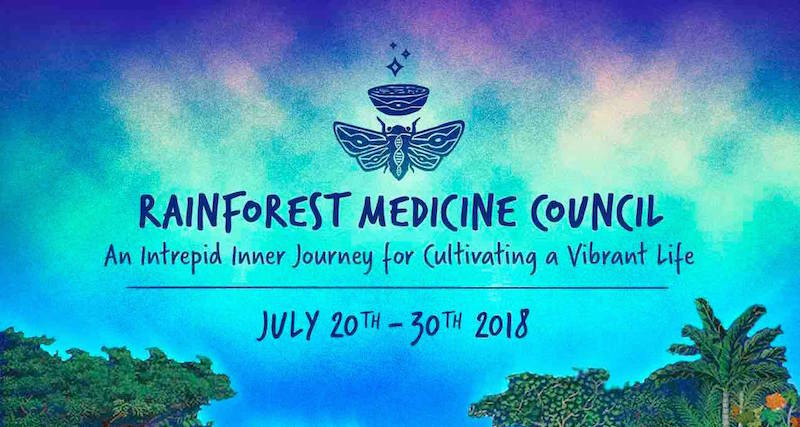 This July 20–30th, 2018, he will be hosting another of his bi-annual Rainforest Medicine Gatherings. To learn more about the retreat and his book Rainforest Medicine, and to register for the retreat, visit www.rainforestmedicine.net.